Where there is a will there is a way....for a mass killing. It just amazes me how Americans live in the greatest country in the World, and despicable and callous acts, like this one below, continue to go on and on with no end in sight to the insanity. How such innocent children and unarmed adults can have their lives snatched away in such a disgusting way. 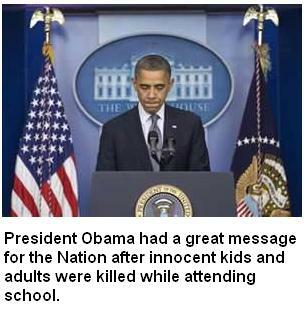 Another example of how "shock and awe" seems to be the main focus of individuals who have no respect for human life. They know they are going to end their own life and so they make sure that they take a lot of innocent people with them to claim the notoriety that the news media will bring to them in the aftermath. I have to wonder if this guy below may have killed his mother first as a way of preparing himself for the human slaughter and the killings at the school. In other words, if you can shoot your own mother in the face four times, it makes it a lot easier for that individual to be psyched up to go to a school and shoot little kids and adults in the face. A person who shoots a child or anyone else is way beyond my understanding. America is just super loaded with people who could care less about the life of other human beings. Many of whom are depressed, angry, suicidal, anti-social, lacking empathy and would love to have their name become a household word through the huge media coverage provided mass killers in America today. Suppose for a moment that just 10% of 1% of 1% of the U.S. population of nearly 312,000,000 million people are encouraged in the future, for whatever reason, to commit these kinds of acts. 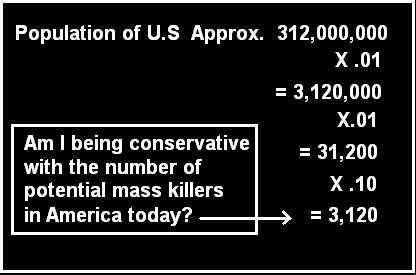 That equates into a staggering 3,120 potential mass killers in the U.S. So, fill up your popcorn bucket and get ready for the continuation of the never-ending "shock and awe" that goes on in America. Followed by the usual three days of "we need gun control" rhetoric and the never-ending news media coverage afforded to these murderous cowards. Maybe I will spend some time writing out about 10 new speeches to offer President Barack Obama for him to use in the next 10 mass murders that will take place in the future. You know, some fresh thoughts.